A Minnesota man charged with felony first-degree assault and riot charges in the November 2015 shooting of five people at a Black Lives Matter protest was convicted by a jury Wednesday. 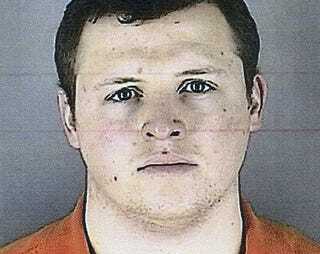 The Star-Tribune reports that the jury deliberated for seven hours before finding Allen “Lance” Scarsella, 24, guilty on all counts following two weeks of testimony. Scarsella was charged with 12 counts of first-degree assault and one count of riot in connection with the shooting at a Nov. 23, 2015, Black Lives Matter protest over the police-involved death of Jamar Clark. The verdict surprised many in the black community who expected to hear “not guilty,” Minneapolis NAACP President Jason Sole told the Star-Tribune. One of those surprised by the verdict was Cameron Clark, one of Scarsella’s shooting victims, and Jamar Clark’s cousin. He reportedly nodded in relief as each decision was read, and a few others in the courtroom cheered. According to the Star-Tribune, protesters had formed an encampment at the Minneapolis Police 4th Precinct following Jamar Clark’s death at the hands of police in 2015. Scarsella and three friends went to the encampment to live-stream as they trolled the protesters. Scarsella had done so previously with another friend a few days earlier when they wore masks and drove by, hurling racial slurs at those gathered. That video circulated online, causing protesters to become suspicious of anyone who came to the encampment with a mask. Scarsella and his friends covered their faces when they showed up a few days later. Protesters quickly went up to them and demanded they take off their masks, according to trial testimony. When they refused, the four went north up a street as protesters followed. The pursuit stopped, but then several protesters said they heard someone from Scarsella’s group shout the n-word. “Me and a group of people started running toward them,” said Wesley Martin, one of the shooting victims. About a block from where the group of four started, Scarsella opened fire and unloaded his magazine on a group of about seven protesters. Martin, Cameron Clark, Tevin King, Walter Hoskins and Draper Larkins were all shot that night. King suffered the most serious injuries and required emergency surgery; the bullet remains inside him because a doctor deemed it too dangerous to remove. In addition to Scarsella being charged, Nathan Gustavsson, 22; Daniel Macey, 27; and Joseph Backman, 28, were charged with second-degree riot and aiding an offender. Scarsella testified that he shot in self-defense because his life and Gustavsson’s were in danger, and that he fired when he thought he saw one of the protesters pull out a knife. Scarsella has been jailed since the shooting in lieu of $500,000 bail and is scheduled for sentencing March 10, when he faces a maximum sentence of nearly 20 years in prison. Hennepin County Attorney Mike Freeman lauded Wednesday’s verdict. Read more at the Star-Tribune.